Rosella Bjornson is Canada’s first woman commercial airline jet aircraft pilot and Canada’s first woman airline captain. Rosella Bjornson makes history by becoming Canada’s first woman airline jet aircraft pilot – April 1973. The Alberta Labour History Institute (ALHI), the Alberta Aviation Museum, and Elevate Aviation (an organization to promote women in aviation) invite you to come to learn about and celebrate the historic achievements of Capt. Rosella Bjornson and her contributions to the advancement of women in aviation. Capt. 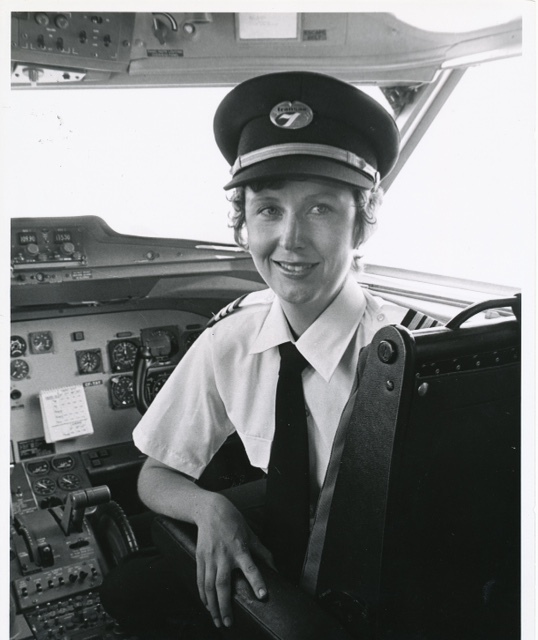 Bjornson is Canada’s first woman commercial airline jet aircraft pilot and first woman airline captain. She is also the first woman member of the Canadian Air Line Pilots Association (CALPA). She was inducted into Canada’s Aviation Hall of Fame. Originally from southern Alberta, she now lives in the Edmonton area. At the November 5 celebration, the Alberta Labour History Institute will be presenting excerpts from its new videos featuring Capt. Bjornson and her historic achievements and contributions. Admission to the event is free. Please let us know by e-mail if you are planning to attend. The ALHI e-mail is office@albertalabourhistory.org. ALHI’s project Moving Forward: Alberta Women and Work is generously supported by the Edmonton Heritage Council and the Alberta Historical Resources Foundation.